understand that variations in heating are common and are actually a benefit. The left side of the griddle is made to be slightly hotter than the right (partly due to the behavior of heat in the heating element, and partly to give you the option of cooking two or more foods at once). Food should be added right to left if you're cooking the same item across the surface. That will give the items a more equal cooking time. The Broil King heats up to 425 degrees. Prepare giant breakfast feasts for a large family or small gathering, sausages with peppers and onions, a stack of burgers. The 21x12-inch heavy cast cooking surface is nonstick and features a removable stainless steel backsplash. The rear legs can flip down (if you choose) to form an angled griddle to drain fat as you cook. The base can be immersed for cleaning. 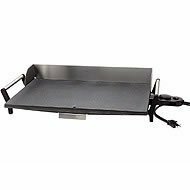 The griddle also comes with a removable grease tray and a commercial cord/heat control unit. It works much like that of an electric skillet, so there's no need to be afraid that it is complicated to assemble or use. Also see the Presto Tilt 'n Drain Griddle.